A large pearl in an oyster shell on sand. Pearl diving has been an important part of human culture for millenniums. Used as primitive currency, jewelry and a symbol of wealth, pearls -- and the divers who pursue them -- have greatly influenced local economies throughout history. 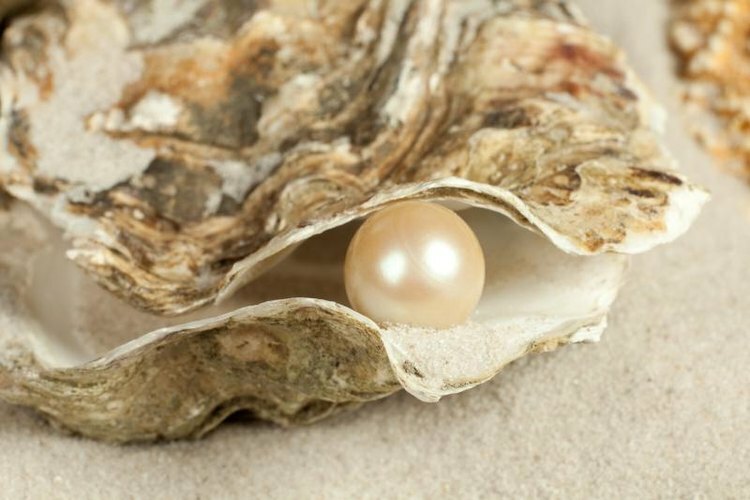 Pearls differ from diamonds, rubies and other precious stones that are created by geological processes – pearls are formed by a few different mollusks, especially oysters. Collecting them requires the services of a skilled and brave diver. Pearl divers must swim well and be in excellent physical condition. Historically, pearl divers would make between 40 and 100 dives each day, briefly surfacing between each descent to catch their breath. To collect the oysters, pearl divers must sometimes travel up to 120 feet below the surface, where they must work for up to two minutes before returning to the surface. Pearl diving has been an important occupation and activity for thousands of years. The tradition dates back more than 7,000 years in Mexico, but the world pearl market was dominated by the Indian Ocean-based markets for about 4,000 years. However, at the beginning of the 20th century, safer job opportunities became available, and many pearl divers changed careers. For example, the growth of the petroleum industry reduced the number of pearl divers working in the Persian Gulf. While natural pearls created the industry, man-made pearls have supplanted much of the commercial pearl-harvesting trade in the modern world. Oysters normally make pearls as a by-product of their internal defenses – when a grain of sand penetrates the mollusk’s shell, the oyster deposits layer after layer of a substance called nacre around the trespassing debris. After a length of time, a pearl is formed. Those who culture oysters accelerate this process by intentionally seeding live oysters with grains of sand. Oyster populations have plummeted in many popular pearl-diving areas. Mexican oyster beds are among the most severely impacted populations. By the early 1900s, the decline in oyster populations made pearls nearly impossible to harvest. Accordingly, Mexico banned pearl diving completely in the early 1940s. The rising difficulty in locating pearls and the emergence of methods for culturing pearls – which do not always require divers -- have contributed to a sharp decline in the number of modern pearl divers. Pearl diving is a very dangerous activity. Among other risks, divers may drown, suffer from decompression sickness, experience hallucinations or encounter dangerous creatures of the sea. Divers routinely find themselves face to face with sharks, sawfish, jellyfish, stingrays and barracuda. MexConnect: Did You Know? Mexico Was Once the World's Major Source of Pearls.